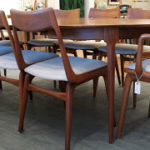 This Heywood Wakefield 6 chair, drop-leaf extension set is from the “Harmonic” line. 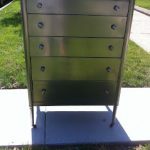 It is “Honey Wheat” in color and is made of solid Northern Yellow Birch. Did you know that when most designers were starting out, they worked with one company or another to get their footing? Two greats come to mind–Donald Deskey & Paul Frankel!! Yes, those bad brothers designed for Heywood-Wakefield! 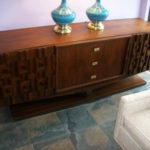 quietly & completely lends itself to todays design trends. 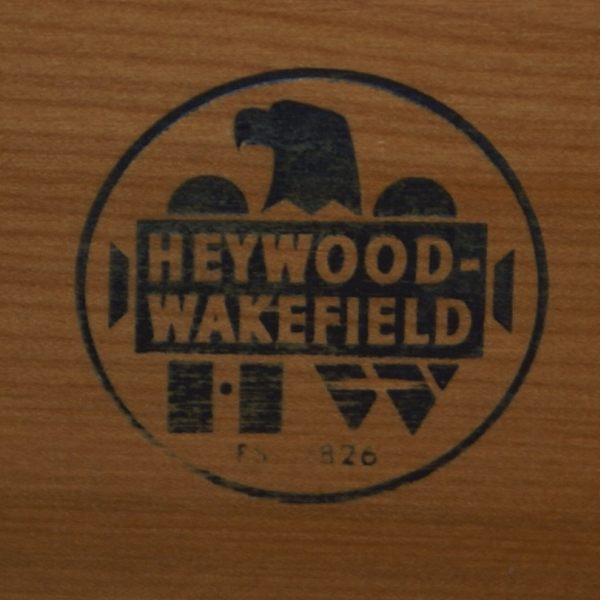 *All pieces stamped with the authentic Heywood Wakefield emblem. 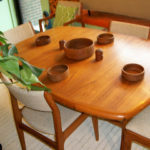 Harmonic D/R Table & Chairs, 1954-55. 63 x 42 with leaves up.